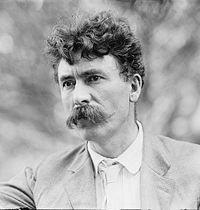 Ernest Thompson Seton (August 14, 1860 - October 23, 1946) was born in England of Scottish parents. He was raised in Canada and became a naturalized United States citizen. Seton was a noted artist, author, scientist and conservationist. He was founder of the Woodcraft Indians and one of the founding pioneers of the Boy Scouts of America. Not only did he believe in educating and training boys in a practical sense, he developed a code of ethics that would instill in them high standards of human development and service. His ideas were a major influence on Lord Baden-Powell, the founder of worldwide Scouting. His notable books related to Scouting include The Birch Bark Roll and The Boy Scout Handbook. He is responsible for the strong influence of American Indian culture in the BSA. Seton is also recognized, along with William Bartram, John Audubon, John Burroughs and John Muir, as one of America’s most influential naturalists. He is credited with being the seminal figure in the emergence of the American conservation philosophy in the early twentieth century. He was born Ernest Evan Thompson in South Shields, County Durham (now part of South Tyneside, Tyne and Wear), England of Scottish parents. His family emigrated to Canada in 1866. As a youth, he retreated to the woods to draw and study animals as a way of avoiding his reportedly abusive father. He won an Art scholarship to the Royal Academy in London. He later rejected his father's name and changed his name to Ernest Thompson Seton. He believed that Seton had been an important name in his paternal line. He developed a fascination with wolves while working as a naturalist for Manitoba. There he became successful as a writer, artist, and naturalist, and moved to New York City to further his career. Seton later lived at Wyndygoul, an estate that he built in Cos Cob, a section of Greenwich, Connecticut. After experiencing vandalism by the local youth, Seton invited them to his estate for a weekend where he shared with them stories of American Indians and of nature. He was married twice. The first marriage was to Grace Gallatin in 1896. Their only daughter, Ann, was born in 1904 and died at 85 years old in 1990. Ann, who later changed her first name, became a best-selling author of historical and biographical novels as Anya Seton. According Ann's introduction to the novel Green Darkness, Grace was a practicing Theosophist. Ernest and Grace divorced in 1935, and Ernest soon afterward married Julia M. Buttree. Julia wrote works with Ernest and by herself. They did not have any children, and adopted an infant daughter, Beulah (Dee) Seton (later Dee Seton Barber), in 1938. Dee Seton Barber died at 68 years old in 2006. In addition to disputes about the content of and Seton's contributions to the Boy Scout Handbook, conflicts also arose about the suffrage activities of his wife, Grace, and his British citizenship. The citizenship issue arose partly because of his high position within BSA, and the federal charter West was attempting to obtain for the BSA required its board members to be American citizens. Seton drafted his written resignation on January 29, 1915, but he did not send it to BSA until May. Seton was an early pioneer of the modern school of animal fiction writing, his most popular work being Wild Animals I Have Known (1898), which contains the story of his killing of the wolf Lobo. This book is still in print. In 1931, he became a United States citizen. Seton was associated with the Santa Fe arts and literary community during the mid 1930s and early 1940s, which comprised a group of artists and authors including author and artist Alfred Morang, sculptor and potter Clem Hull, painter Georgia O'Keefe, painter Randall Davey, painter Raymond Jonson, leader of the Transcendental Painters Group, and artist Eliseo Rodriguez. He died in Seton Village in northern New Mexico at the age of 86. Seton was cremated in Albuquerque. In 1960, in honor of his 100th birthday and the 350th anniversary of Santa Fe, his daughter Dee and his grandson, Seton Cottier (son of Anya), scattered the ashes over Seton Village from an airplane. The Philmont Scout Ranch houses the Seton Memorial Library and Museum. Seton Castle in Santa Fe, built by Seton as his last residence, housed many of his other items. Seton Castle burned down in 2005; fortunately all the artwork, manuscripts, books, etc., had been removed to storage before renovation was to have begun. Ernest Thompson Seton was co-founder of the Boy Scouts of America and author of the first Boy Scout Handbook. He also founded the Woodcraft League, an equally influential organization which has had an influence on the lives of young people worldwide. Not only did he believe in educating and training boys in a practical sense, he developed a code of ethics that would instill in them high standards of human development and service. Both a naturalist and a writer, Seton was committed to educating others about nature and the environmental consciousness and skills of Native Americans. At a time when the nation was urbanizing and industrializing, he provided opportunities for youth to experience life away from the cities. Envisioning an "an academy of outdoor-life," in 1930 he established a 2,500-acre ranch in the foothills of the Sangre de Cristo Mountains of New Mexico. In addition to his residence, the property contained a museum, library, art gallery and lecture hall. There, Seton Village developed as friends and colleagues settled together with a common vision. ↑ David C. Scott, 2006, "The Origins of BSA's 1910 Handbook." International Scouting Collectors Association Journal. 6(4): 6–13. ↑ American Traditional Scouting. Traditional Scouting Retrieved February 20, 2009. ↑ David C. Scott, "Ernest Thompson Seton and BSA - The Partnership Collapse of 1915." International Scouting Collectors Association. (June 2006) 6(6): 10–16. ↑ Clemont Marot Hull, 1938-1942 Santa Fe Retrieved February 20, 2009. ↑ Julie Ann Grimm, 2005, "Seton Castle destroyed by fire." Santa Fe New Mexican. Blue Sky! - The Ernest Thompson Seton Pages. Ernest Thompson Seton Institute Retrieved February 16, 2009. National Park Service. National Historic Landmarks - Seton Village Retrieved February 16, 2009. 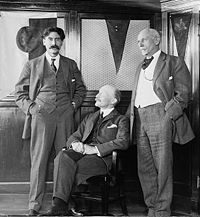 History of "Ernest Thompson Seton"
This page was last modified on 17 August 2017, at 14:12.